Updates: OutGayLife.com has removed some copyrighted material. Other material, including newly found, copyrighted material, remains live on the website network. Updates are found at the end of the article. This website network has been allegedly violating copyright laws and infringing upon the intellectual property of several LGBT publications, blogs and mainstream press organizations. 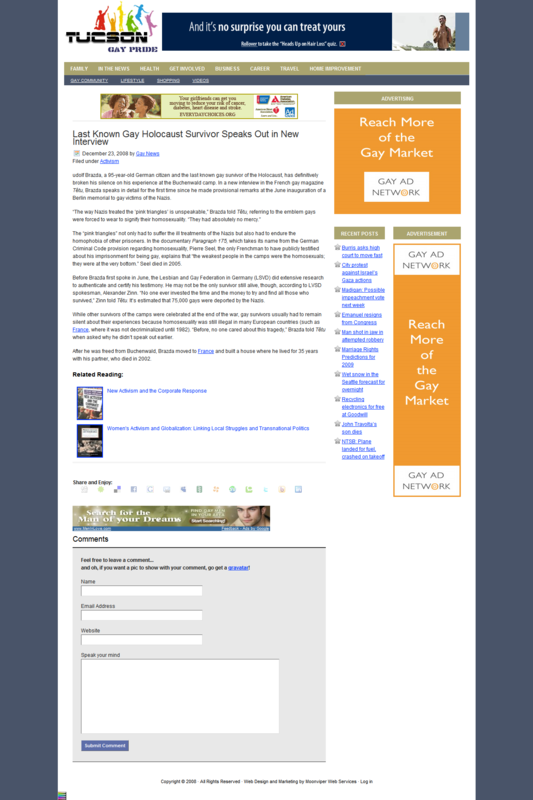 An LGBT website network operating under the banner of OutGayLife.com is possibly guilty of violating copyright and intellectual property laws for its reposting and republishing of news stories, features, blog posts and articles from LGBT publications, blogs and mainstream press and news organizations. Based in Edina and Bloomington, Minn., design and SEO company Moonviper.com operates the network which owns at least 21 other domains. Each of the almost two dozen other domains point to the same or similar content. 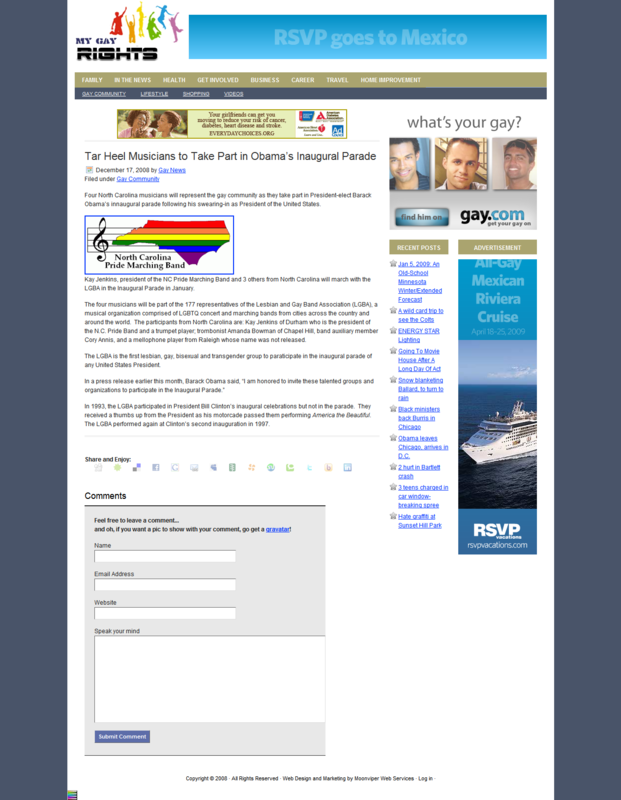 Other websites in the network include MyGayRights.com, MyGayPride.com, BigGayTrip.com and several localized domain names such as DCGayBars.com, GayPalmBeachOnline.com, MyGayPheonix.com and SFGayLife.com. WHOIS information on the domains revealed Eric Wood was the registrant. Contacted by InterstateQ.com via phone on the morning of Monday, Jan. 5, Wood identified himself as the owner of Moonviper. Browsing the network’s webpages, InterstateQ.com found at least 17 separate cases of possible infringement on the copyrights of LGBT publications, blogs and mainstream publications. The possibly illegally posted material included at least seven articles from the Asheville, N.C.-based gay newspaper Stereotypd (formerly, Out in Asheville) and its gay news blog. Other instances of possible copyright infringement included republished content from The Advocate, the nation’s premier LGBT news-magazine; an op-ed from the blog of former Washington Blade editor Chris Crain; a blog post by The Atlantic‘s Andrew Sullivan; a blog post from New America Media, a coalition of over 2,000 ethnic news organizations; and several blog posts from BoxTurtleBulletin.com, a premier LGBT blog researching the anti-gay and ex-gay right. Wood’s websites also reposted, in a five part series under the title “Editor’s Picks,” the entire content of Newsweek‘s “Our Mutual Joy,” a popular article on gay marriage and religion. The Associated Press has been known to take swift action against other news organizations and websites found to have republished their content without permission. Many bloggers have complained of The AP’s attempts to have as little as one quoted paragraph removed by a website operator. Screenshots of possible copyright infringement by OutGayLife.com can be seen at the bottom of this post. Wood, based in Bloomington and Edina, Minn., said that he did not know republishing the content was illegal and that “from time-to-time” publications contact him and request to have their content removed or a link back to the original material published. Wood said he receives a large portion of his content from automatic feeds and that his company is making a move to a user-submitted content model. He said that Stereotypd (Out in Asheville) had contacted him requesting to add a link back to their original material. He said he’d not yet had a chance to do that. Porscha Yount, Stereotypd associate publisher, said that she had contacted Wood requesting the link back and when she did not get a response, instructed the publication’s attorney to contact Wood and demand removal of the copyrighted pieces. She said that the attorney might not have yet contacted Wood due to the holidays. 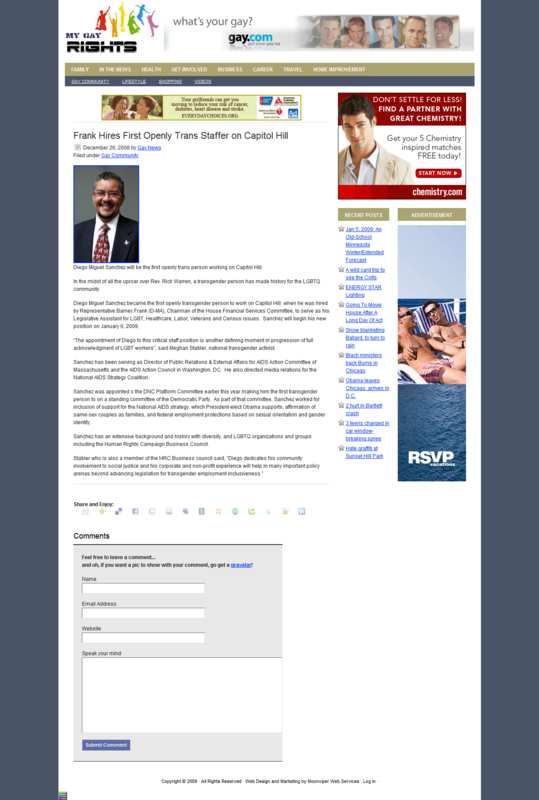 Wood refused to commit to removing the copyrighted material on his website as brought to his attention by InterstateQ.com. He said there are “many sides to every story” and seemed ambivalent toward the instances of copyright infringement on his websites. He said he does not currently have a professional or business relationship with The Associated Press. By 12:30 p.m. on Monday, Jan. 5, after being contacted by InterstateQ.com earlier the same day, all AP content had been removed from OutGayLife.com’s network. Newsweek‘s “Our Mutual Joy” article had also been removed. 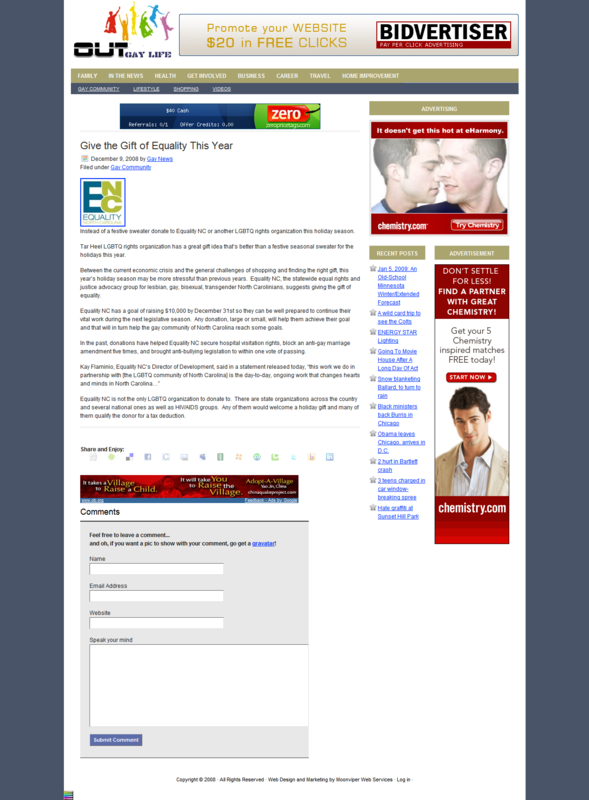 The OutGayLife.com website network, affiliated with design and SEO company Moonviper.com, sells advertising for its several websites and is a member of the Gay Ad Network on Adify, a popular advertising network used by premier LGBT news publications and blogs. Elderkin said he would have his head of publisher relations review the OutGayLife.com website today. “If this is happening, we will send him a notice and pause the campaigns.” He added that many sites use RSS feeds to draw in content from other sites, and that accusations of copyright infringement in these cases aren’t as clear-cut an issue. Content from LGBT and mainstream publications are generally protected by copyright. Most, if not all, publications require parties to receive prior, written permission from editors or publishers before their print or online content is republished by an outside party.republishing the content that appears in print or online. Content from blogs usually require those republishing the content to cite the source and provide a link to the original material. Wood did not note on his website whether he gained prior written permission to republish material from the publications and did not cite reposted blog contents’ original authors or link to the original sources. InterstateQ.com contacted The Associated Press seeking comment on copyright infringement and intellectual property issues. Updates (01/06/2009): As of the morning of Jan. 6, Wood had removed many of the possibly illegally republished articles and posts from his website network. Many others, including the op-ed from Chris Crain and the blog post from Andrew Sullivan, remained live. 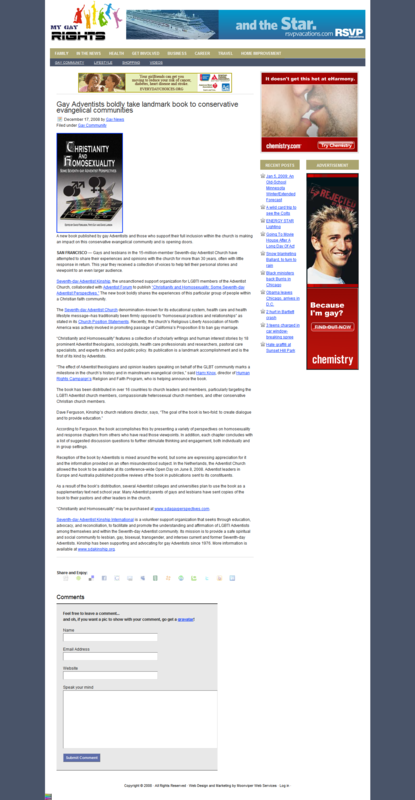 The entire content of a blog post from BoxTurtleBulletin.com remained live with an addition of an “original source” link. The post’s original author remained uncited. An article from UK Gay News and GayRussia.ru had been removed, as well as articles from Stereotypd. Posts from GoodAsYou.org were also removed. 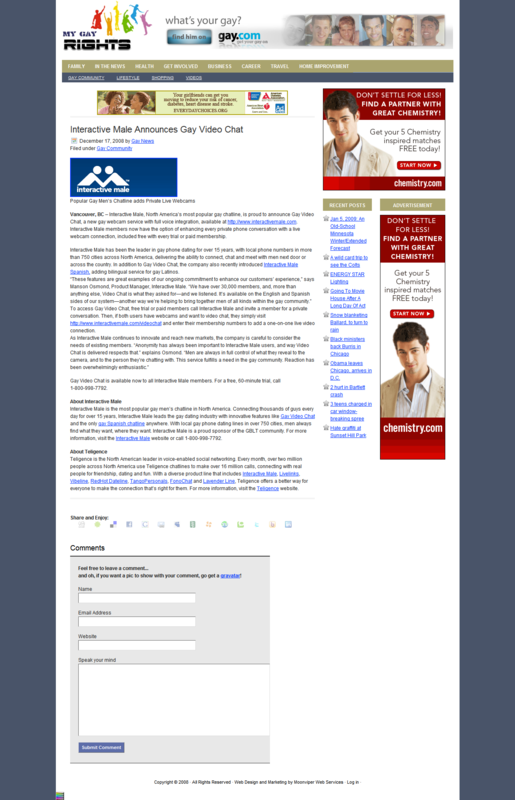 Other writings, such as syndicated content from ARAContent (here and here) remained live, without attribution to the original source, as ARAContent terms and conditions require. 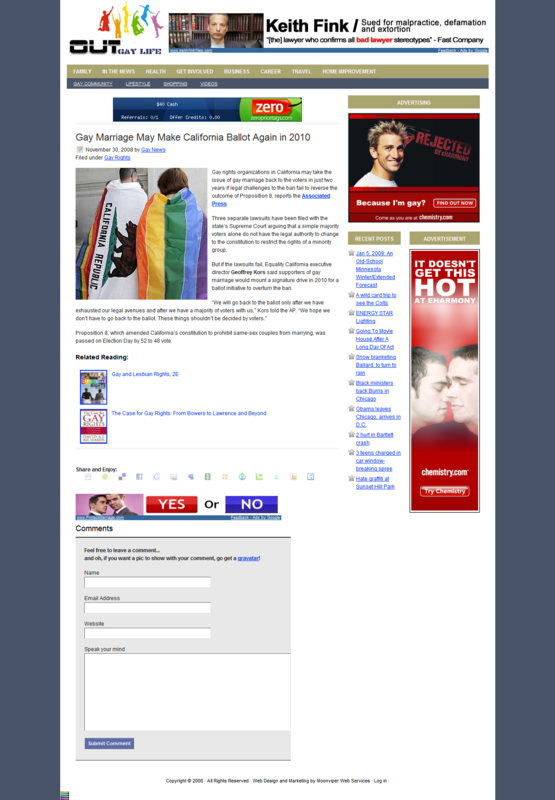 An article from The Berkeley Beacon remained live on OutGayLife.com, without attribution to the original source and author, and without a link back to the original source. Copyrighted content from Ask Yahoo! 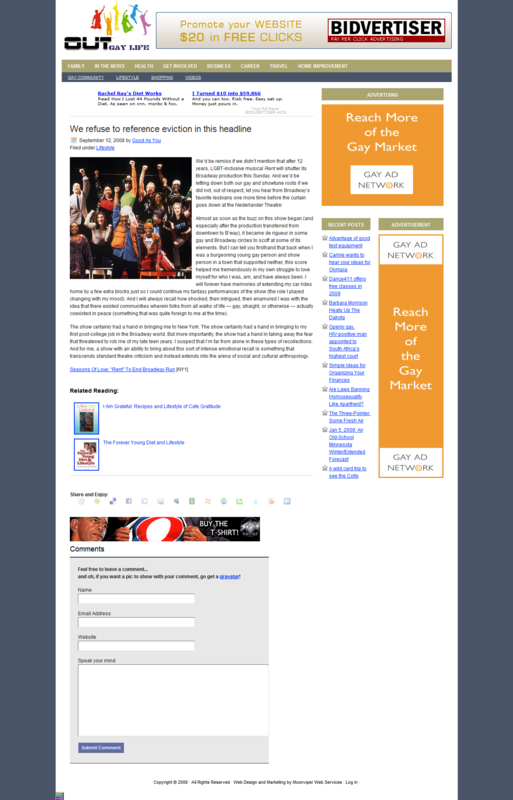 remained live on the OutGayLife.com website network without attribution to the original source and author, and without a link back to the original source. Updates (01/06/2009, 10:48 a.m.): More stolen content found at OutGayLife.com’s network including the entire content of an opinion piece originally written at Bonilogue.com but posted on OutGayLife without attribution. Stay tuned to InterstateQ.com for more on this story. 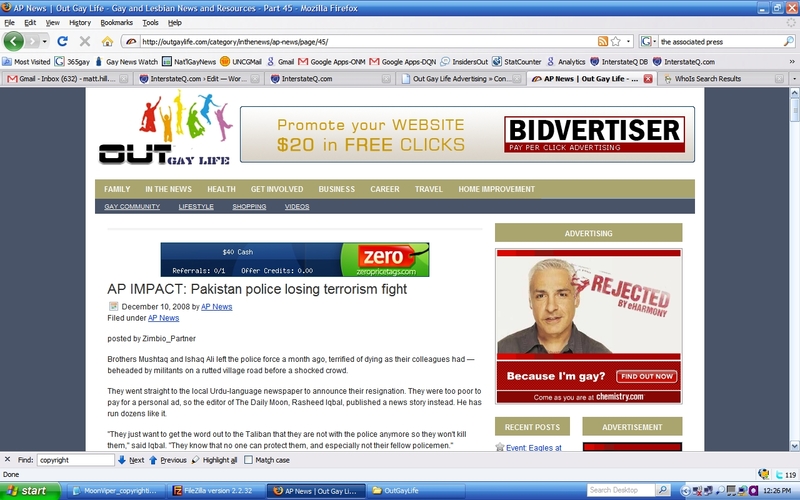 Screenshot 1 – Original article appeared in Russian on GayRussia.ru. 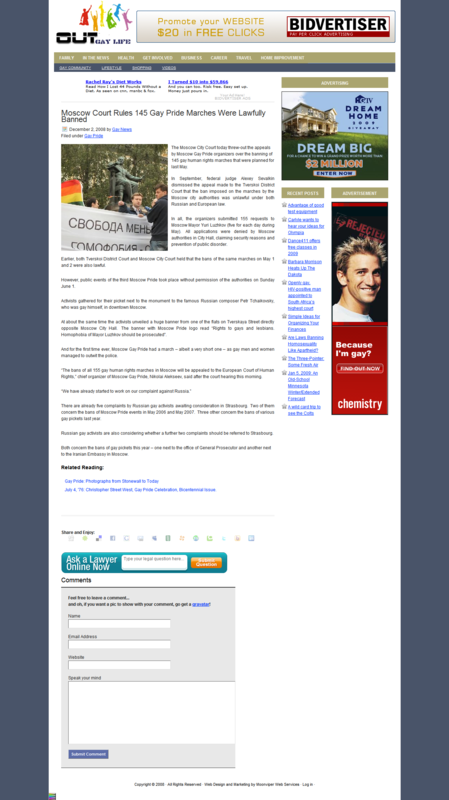 UK Gay News translated the article with permission and posted it both at UK Gay News’ website and at GayRussia.ru. Reference comment below. Are you the victim of copyright infringment? This contact information was updated on Nov. 11, 2009. Wood now resides and works in San Francisco, Calif. But even with the link, the usage is completely inappropriate. Kip Esquire was kind enough to notify me of an article they stole from me and they’ve now removed it at my demand. The stupid thing is that I would have happily given them permission to use it if they’d just asked. I have a policy of allowing anyone to reprint anything they’d like from my blog as long as they give me credit for it. Since that site neither asked my permission nor gave me credit for the article, I told them to take it down. OutGayLife.com is VERY well-known to me and to Nikolai Alexseev who runs GayRussia.ru in Moscow â€“ for ALL the wrong reasons. Both of us have been ripped-off twice by this person/site. And emails pointing out breach of copyright have gone unanswered â€“ the offending pages have not even been taken down! A good case in point is from the beginning of last month and an article on a Moscow court throwing out an appeal by Moscow Pride against the ban by the notorious Mayor of Moscow in the 2008 event. On December 2, Nikolai sent me a Google on-line Russian to English translation of the article he wrote. This is at http://www.gayrussia.ru/events/detail.php?ID=12541 in Russian. My English (UK English spelling) translation/authorised re-write is at http://www.ukgaynews.org.uk/Archive/08/Dec/0201.htm – published around 2pm on December 2 with Gay Russia posting what I had done in their English language section at http://www.gayrussia.ru/en/inf/detail.php?ID=12549 â€¦ complete to acknowledgement of my involvement. Spot the difference between the UKGayNews version and what is on the OutGayLife page. To save time â€¦ OutGayLife â€œdroppedâ€ the sub-headline and where I wrote â€œorganisersâ€, the corrected spelling into the US English â€œorganizersâ€. One does not need to be a rocket scientist, brain surgeon or lawyer to decide that this is a total breach of copyright. As all my pages are â€œCreative Commonsâ€ licensed, there was no acknowledgement of the source, and OutGayLife is a commercial operation â€¦ so international copyright rules apply. First came across this site in mid-September when they first used something from my site. As far as I know, I have very good payment claims for a total of 5 articles! Well, I took a look at this one and it appears that the site in question is hosted on ThePlanet. I’ve had lots of good luck getting infringing material removed from sites hosted by them simply by filing a DMCA notice. The process is pretty simple and only takes a few moments. Excellent work Matt. Intellectual theft is deplorable. Was also nice to see the article from the Berkeley Beacon where I was a contributor 35 years ago. Hell, all they had to do was ask me. who is this eric wood?